I want to begin by saying I am now using the "new and improved" blogger interface which places all my photos on the left side of the page. I've had several people suggest how to change that, but I found it doesn't work. Only the text is moved to the left or right of the image, something I find highly annoying when I'm trying to demonstrate something. I also had to turn these into downsized (pixel wise) images, which means my not-very-decent camera is even LESS decent. 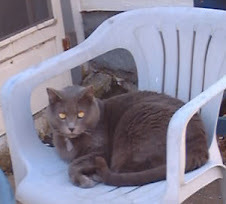 Enough of my whining about Blogger, let's get on with the lesson. 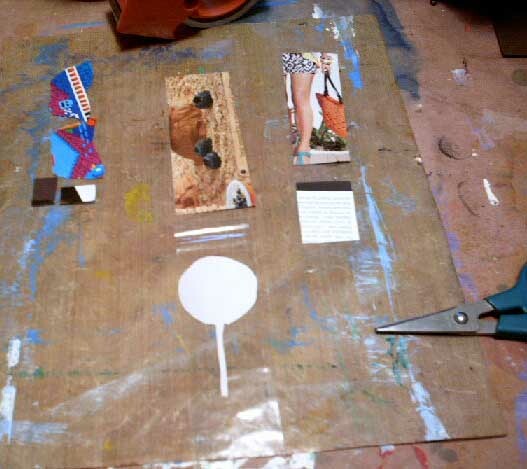 This lesson is all about image transfers and pop-ups. I hope you enjoy it because YOU asked for it!! And now, here it is. I'm starting with a few posts from before, then will continue with the main part of the lesson. After I received a few photocopies of a flyer my friend made, I got out some fabric (another reason for using fabric in your ABs) and my Chartpak blender pen. This pen contains Xylene, a solvent that is highly toxic. Please be sure to use it in a well ventilated area. Although the stuff smells, it is well worth it. I knew I would have a challenge because you always photocopy words backwards for this technique. However, I always work with what I have, so decided to go with a grunge look. 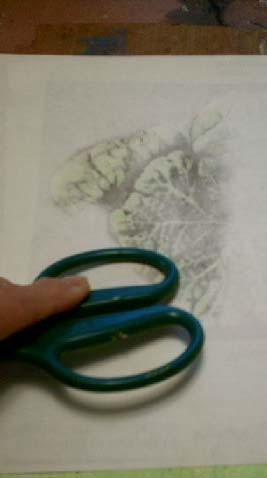 Remember, you MUST use a photocopy with this technique, the only one I offer using a photocopy. 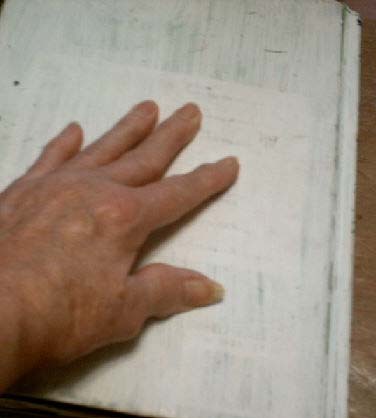 You place the page toner side down on the fabric or paper and swipe the pen over the places you want to transfer. It's immediate and you need very little rubbing, although you need more on the silk than on paper. If it worked so well on silk, would it also work on Tyvek? I grabbed a scrap that was already painted, and tried it. Yep, it worked fantastic on Tyvek, too. 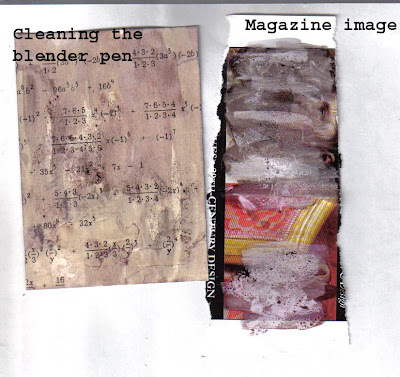 I then tried using the blender pen to transfer magazine images, but all it did was smear the ink onto the end of the blender pen tip and make a huge mess. You can see where I tried to clean the pen tip. I use it again later, as we get further into the lesson. 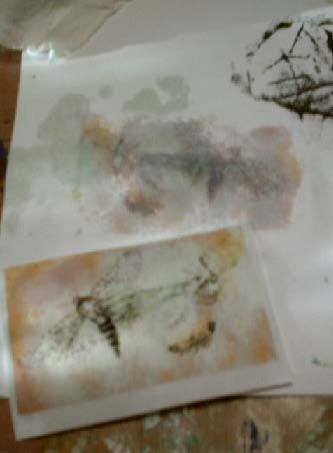 These transparencies were made using sticky book cover material. It's like clear contact paper, only a bit heavier. Both backgrounds are the same. They are made using pages from a phone book that I darkened using brown shoe polish. Both transparencies are of women and are basically the same size. They were ads in a freebie magazine I used to get each month. Please enlarge them to see how well they transferred. I made this for a challenge. I started with a background of hand painted deli paper, then added a magazine image, to which I added a packing tape transfer, and vinyl letters on an 8.5 X 11 (A4) substrate. The irony of this was, I had a sheet of vintage music on my table when I dropped the packing tape on it. The little piece of packing tape that sticks out from the tape gun was enough to stick to the music. I will show this technique, also. For this piece I began with a file folder that had the word "confidential" on it, then added the magazine image (pink strip with the F). To this I added a tape transfer of an old phone. 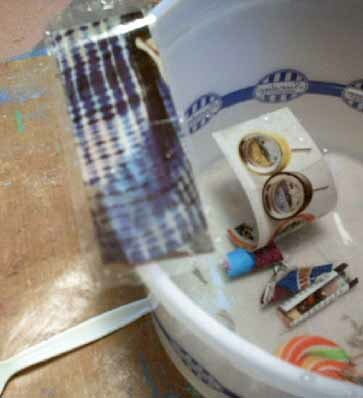 The transfer was made using the same clear contact paper. Next I added a scrap from a book and the ledger scrap that I wrote a sentiment on. Next came the legs, and finally the bits of paint. This was a two page spread for my Recipes AB. The stoves are more contact paper tape transfers, the words are from various book pages, and the girls are from Paper Whimsey. Please enlarge to see the tape transfers. 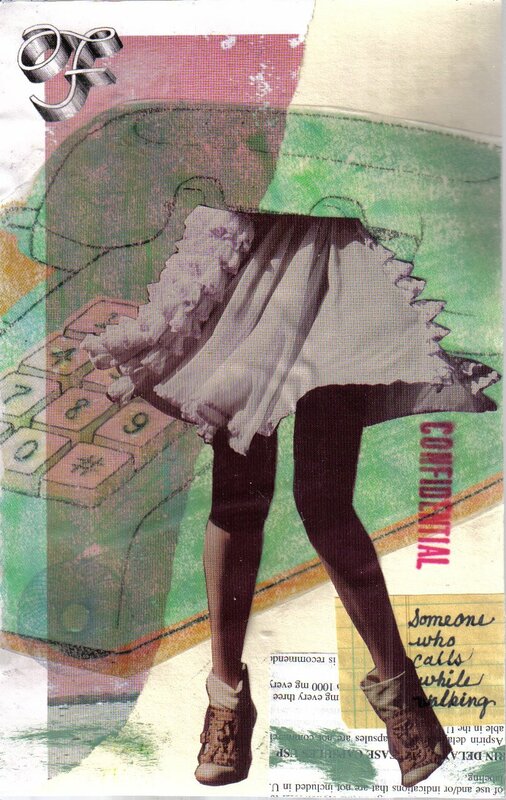 I'm a pack rat when it comes to quirky magazine images. 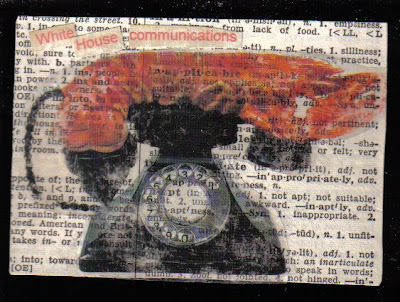 Way back in January, 2009, I heard on the news that President Obama's White House staff was having difficulty adjusting to the antiquated phone and computer technology they found when they settled into their offices, I remembered this quirky magazine photo of an art assemblage. It was the perfect size for an ATC, so I turned it into a tape transfer and glued it over some dictionary definitions. Click for a larger view to find "from lack of food," "not suitable," "silliness," "inarticulate,"and even "American." I couldn't have picked a better page for a background unless I had found the word lobster! Please enlarge to see all the details. Now that you've seen some examples, I will show how these were made. I will also have three more techniques next Sunday when I post my homework. I simply could NOT overload this post any further. Originally, I took photos of each set of pages I was going to turn into transfers and the images I would use for those transfers. But since I'm now fighting having to pay for storage space on Blogger, I decided to delete them. Packing tape (alternately called cold laminate, label, protective, or clear tape) images are probably the most well known and the easiest to make. Most everyone will have this clear tape that is about 2 inches wide. I'm not sure if it is available in the UK, but I suspect it is, only under a different name. 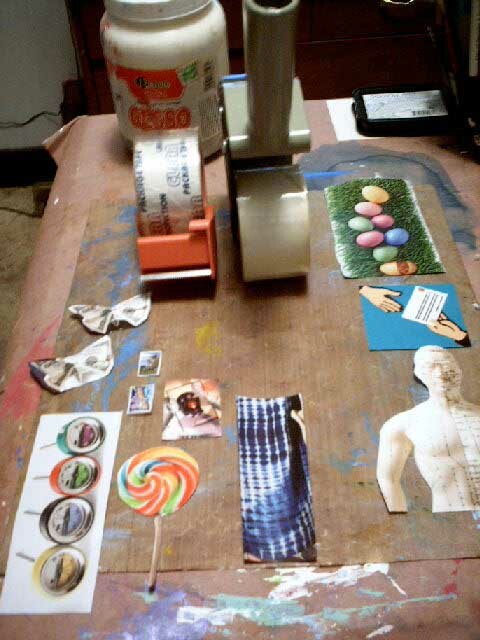 The images on the left will be small enough to make packing tape transfers. The ones on the right will not. When in doubt, be sure to cut them as close to the image as possible. I'm not sure you can see the strip of packing tape I laid sticky side up on my craft sheet. You are now looking at the back side of the blue and white image above. 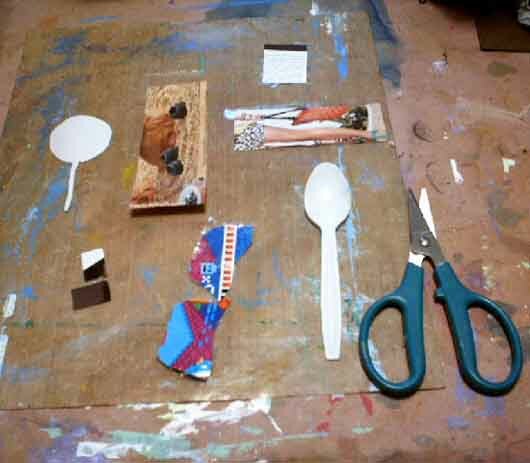 I know lots of people will tell you to lay the image face up on the table, then place the packing tape sticky side against the image. 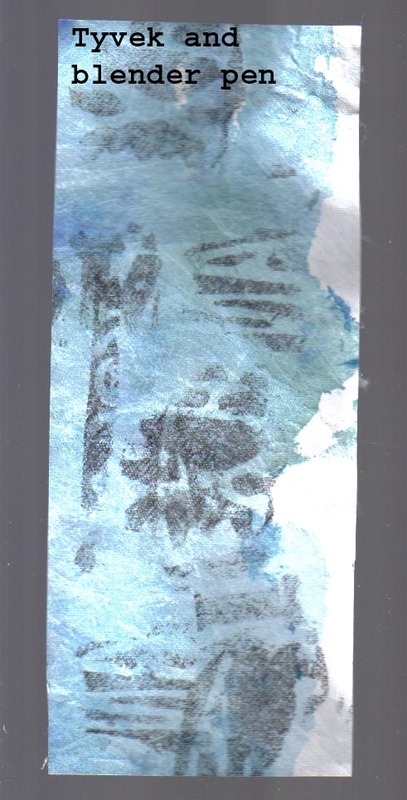 However, I have found the image adheres better when placed on top of the tape. I think it has something to do with static electricity (or maybe my magnetic personality GRIN). You can add more than one image to the packing tape. you should cut the images. Burnish each image. Burnish, burnish, burnish. I cannot reiterate this enough. Burnish in one direction, then at a 90 degree angle, then on both diagonals. How well you burnish is directly proportional to how well the image transfers. Again, you are seeing the back of yet another image. Here is that image, now face up, above after I burnished it. drop the images into a bucket of warm water. Watch as they begin to curl. Begin removing the paper. You can see where I've begun. One thing I should point out is white paper is the absence of color, so any time you see white, it will show up as clear in your transfer. 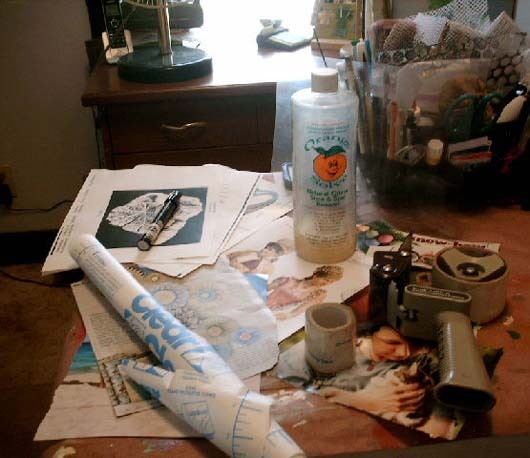 Here I've finished removing all the paper backing from all the transfers. There are two things I need to point out. One is dangerous, the other is NOT. 1. Never ever, ever, EVER dump the paper pulp down the drain, not even your toilet drain. Seriously, this stuff will dry and clog your pipes faster than a heart attack. Take the pulp water outside and dump it, if it's not winter. If it's winter and you can't get outside, pour it on one of your indoor plants. 2. This tape is shiny. You can see the shine even in this lousy photo. Here is an even better view of the shiny nature of this tape. To combat that look, you can cover the entire piece with matte gel medium. 1. Sometimes the outcomes are less predictable, even though you have burnished well. 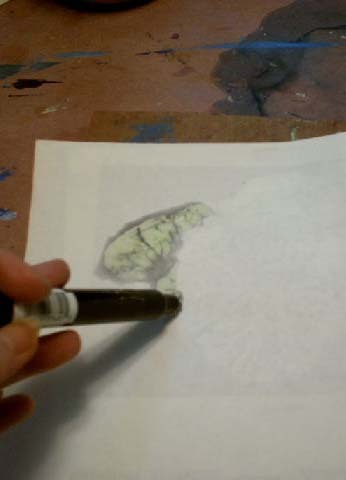 I've also read only the OLD contact paper works for this technique, but since mine is quite old, I've never had a problem with it and really have no way of knowing any difference. 2. This clear "tape" is not shiny, so it doesn't need matte medium. or one of the Golden gel mediums. 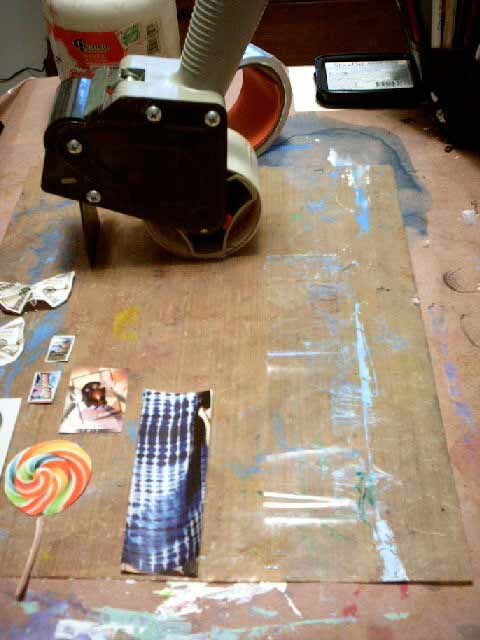 Instead of using packing tape, you can brush a thin layer of gel medium onto the back of the magazine image. 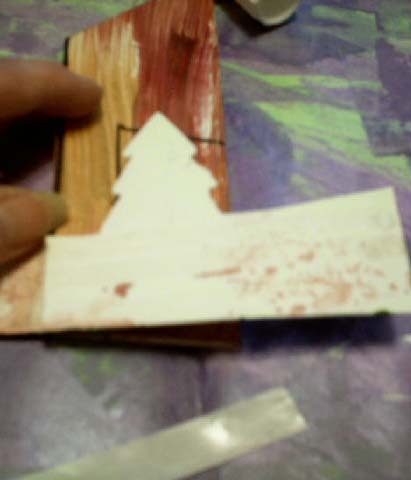 Allow to dry, then brush a second thin layer on, only this time at a 90 degree angle to the first layer. 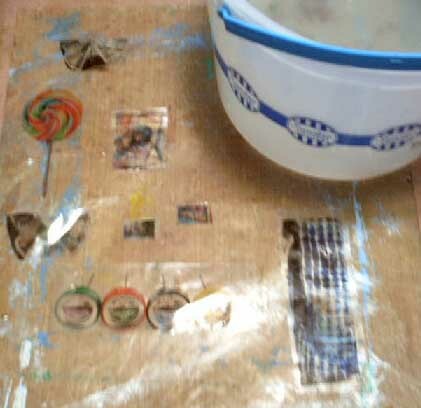 Allow to dry, then add a third layer, this time adhering it to the substrate of your choice. You can use either fabric or paper for this, but be sure to cover the piece completely with the gel medium. 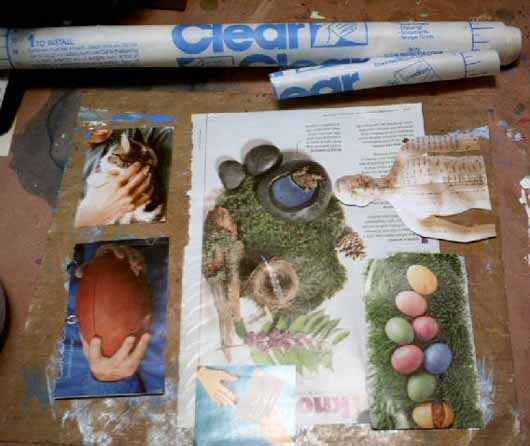 Allow to dry for a third time, then soak and remove the paper backing from the magazine transfer as before. Be sure to collect the paper pulp in a container of water, just like before. Several of you said you had trouble with this technique. This is not rocket science and some magazine images work better than others. 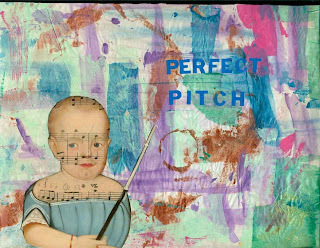 You'll probably get more "less than perfect" images than perfect ones. That's the nature of this technique, which is often meant to have a vintage feel. 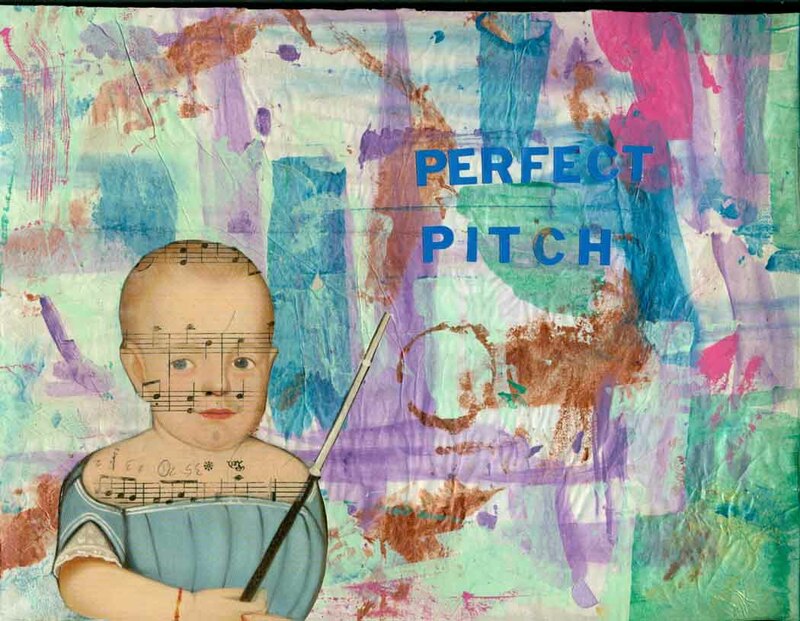 Experiment with different magazines, because some will transfer better than others. 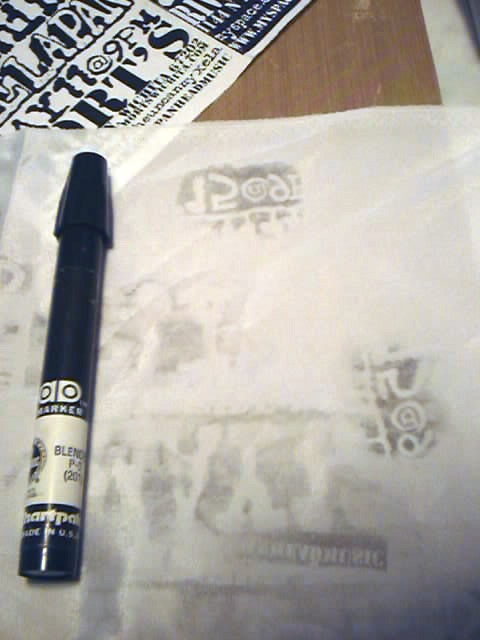 Also, packing tape transfers better than clear contact paper. 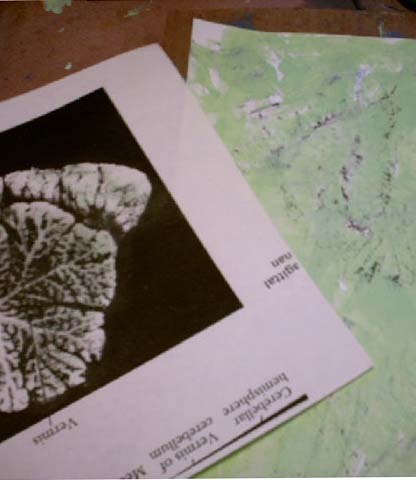 Of course, if you don't have ANY magazines in your home, you can also use photocopies for the gel medium transfer technique. Since I'm so frugal, I try to stay away from transfers that require you to run out to the copy store, then have to ask if the copier makes TONER copies. If the clerk tells you the copier does not make toner copies, go elsewhere. You saw the blending pen earlier, when I created image transfers on silk fabric. Before we begin, if you do an internet search for this pen, you are going to read that you need fresh toner copies. Every place I've been tells that same story. I'm here to tell you, I copied these book pages back in late 1989 or early 1990, when I was working on my master's degree, and had not yet moved to Wichita. I assure you, if you have old toner copies and a blending pen, use them. I promise, it will work! burnished the back as I've done in the past. 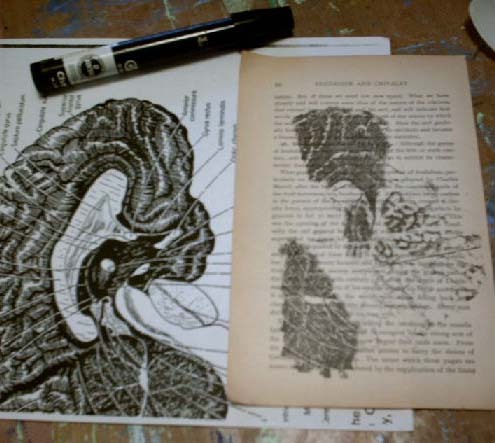 as it did when I used the blender pen to transfer onto a book page. I sure learned something. 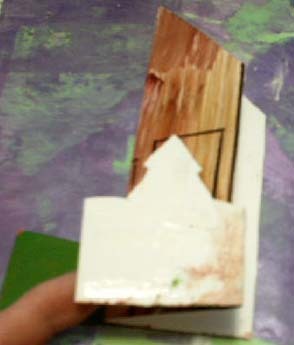 This transfer technique does not work on paint. I saw this on another blog, but didn't save or bookmark the page. 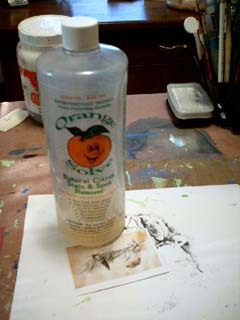 However, my Orange Solve is not the same stuff that was used on the other blog. As I recall, they were both degreasers and multi-purpose cleaners, so I thought I would at least give it a shot. 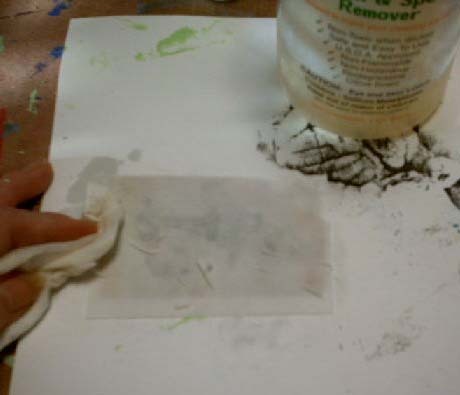 I distinctly remembered it was an inkjet transfer, so that is why I thought of it when I was making this tutorial. 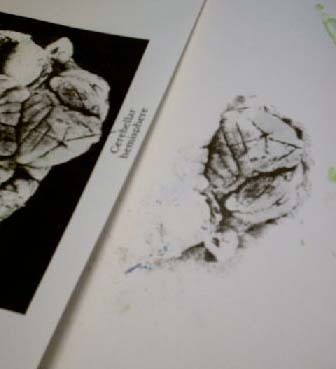 Using a color or black and white image, lay it on the substrate face down. 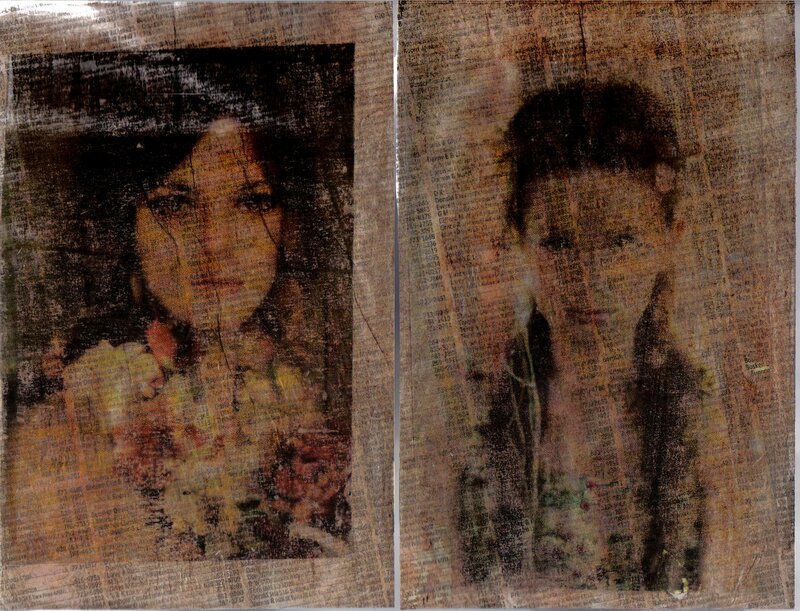 Saturate a cloth or paper towel, then wet the image. Do not saturate the image, or move it while you are dabbing on the cleaner. You can see some of the backing is already coming off, which means I have probably rubbed too hard. 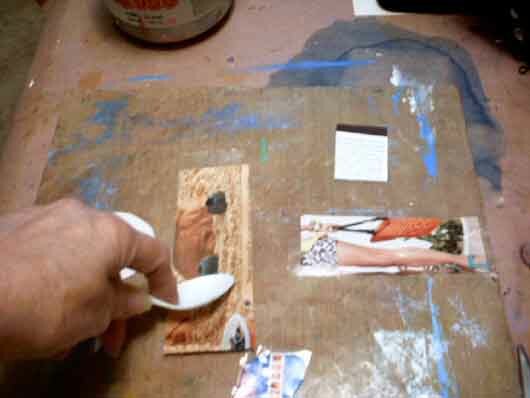 Using a spoon, or other burnishing tool, burnish well. I don't think I burnished well enough, or I got too much cleaner on the paper, or I didn't use the correct product. But you can see, it tried to transfer. Although this technique left something to be desired, I have to admit, I haven't always gotten transfers right the first time I tried a new technique. 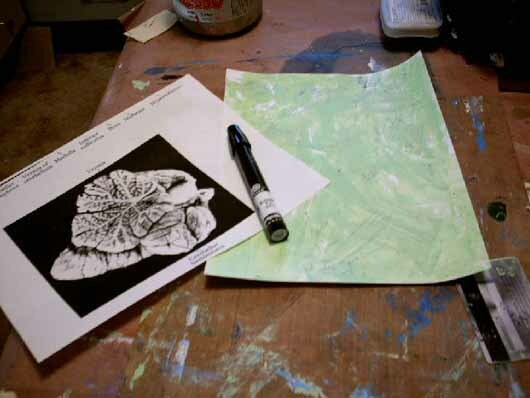 For that reason, I suggest until you are familiar with the technique, transfer your image onto a sheet of paper that is not your substrate, then add the transferred image to the substrate. Of course, that doesn't work if you are transferring to card stock! You might be thinking that this sounds a lot like Citra-Solv, that wonderful product you use to alter National Geographic Magazines. Sadly, Citra-Solv works much like a blender pen on magazine images (see above). If you want to use Citra-Solv, you must use photocopies. Remember, I'll be back next Sunday, when I will demonstrate how to use overhead transparencies to make image transfers (and anything else I can think of). drew a house. 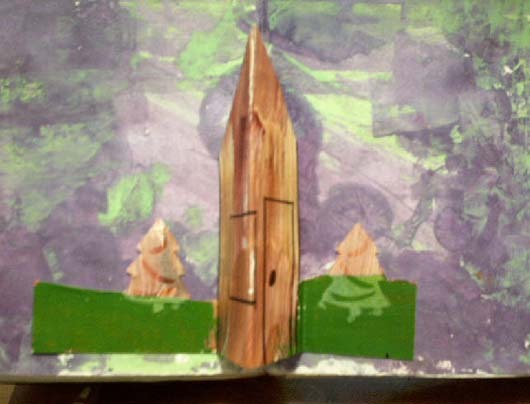 I added two trees that I embossed with clear EP. Next I cut the piece out. 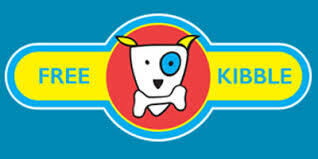 What I learned when I did an internet search for pop-ups was, the image needs to be symmetrical. Also, you need some type of flap which extends past the pop-up image that you can glue to the page. Sadly, my image was not symmetrical. I learned this when I folded the house in what some would call a mountain fold. 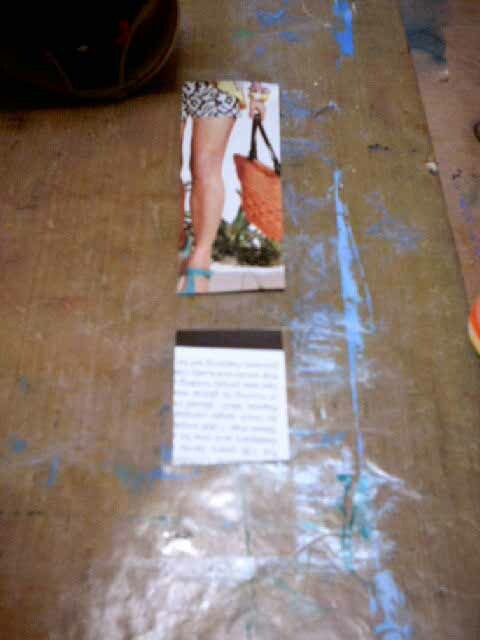 That meant I had a bit of rework to attend to, but first I wanted to audition the glue/tape/adhesive I would use. 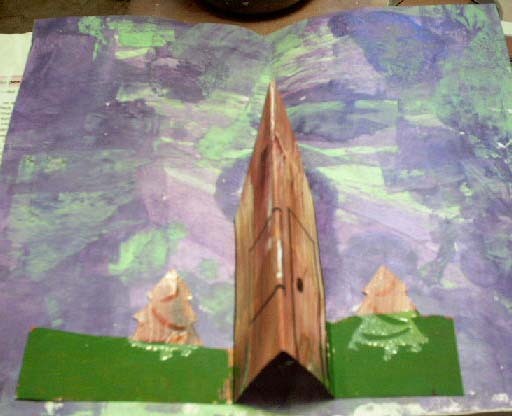 I had already applied a background to the book pages and allowed it to dry. 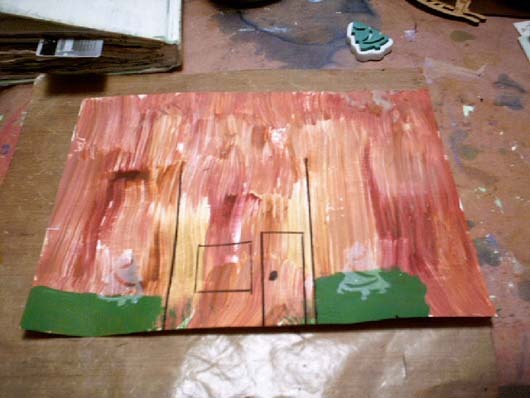 Now note the white back of the cardstock the house was painted on. That shows how far off my center line was. I was able to compensate when I made what some would call valley folds. Note how I extended the grass on the right side of house to match up with the end of the grass on the left. You can't really tell, but I chose some of that sticky tape I am desperately trying to get rid of. I thought it would be the easiest and cause less mess than anything else. Although it's hard to tell, here I've applied the tape to the left side of the image, which is parallel to the center line of the image. then slammed the book closed. I did this very quickly, hoping I didn't disturb anything. When I opened the book, the image popped up. Possibly a bit too far, in fact. Next, I stood the book up so you could see how the pop-up would look when the book was fully opened. 1. Although it is probably best to have a symmetrical image, you can always compensate, as long as the center of the image is in the center of the two page spread. You can see I compensated by extending the grass on the right side of the image, while the grass on the left side is bent directly against the house. 2. It is probably best to measure where you want your image, rather than guessing. 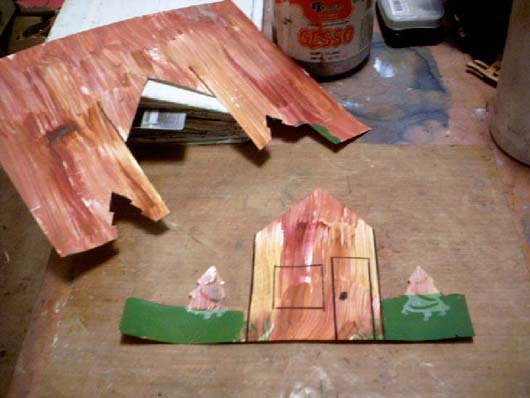 If I were to do this again using a house image, I would not have allowed it to pop open quite as far. 3. Put your wet glue and your glue stick away. 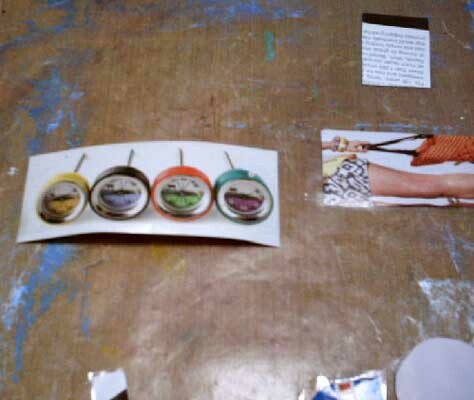 Spring for the double sided tape and use it to adhere your image to the pages. 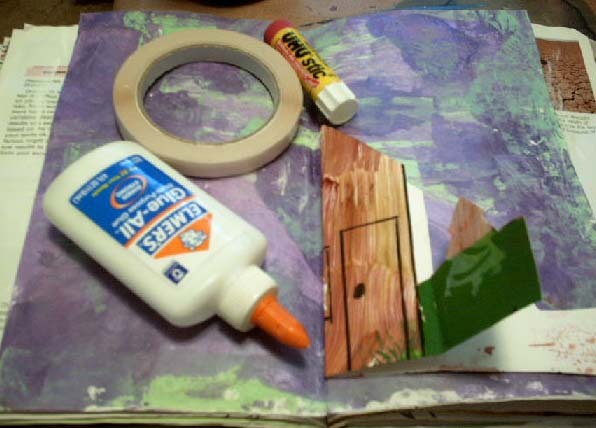 I suspect Elmer's, even gel medium, and the glue stick would have a tendency to slip once I slammed the book shut. And the double sided tape is instant. 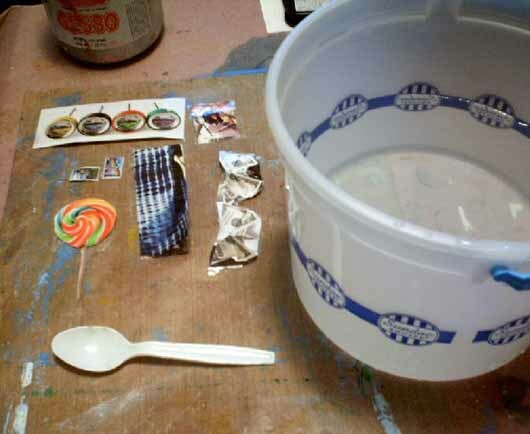 No need to wait for glue to dry. 4. It doesn't matter which side you adhere first, but both sides must be parallel to the center of the page and the image. 5. It would have been great to have one of those scoring tools for the pop-up. I had a hard time getting the house image scored properly, as you might be able to tell from the photo. 6. Regardless what image you use, it is best (in my opinion) to make sure it's on cardstock. If you are using flimsy scrapbook paper or an image from a book, be sure to back it with cardstock. I admit I spent a lot of time on this post, including all the problems I'm having with Blogger. So I hope you will honor me with lots of links showing either an image transfer or a pop-up, or both. And if all those transfers weren't enough, please visit again next Sunday, when I will make three more. It’s time to show us your interpretation of Lesson 16, where you played with fabric in some way. As always, please be sure the link is to the specific post or posts, not to your blog in general. You may also post ANY previous lesson here. Just add the lesson number after your name, please. And thank you SO much for sticking with this class. It's been a lot of fun for me and I hope it has been for you, too. what a lot of work. For some reason since the class in 2003 I have never been interested in transfers. 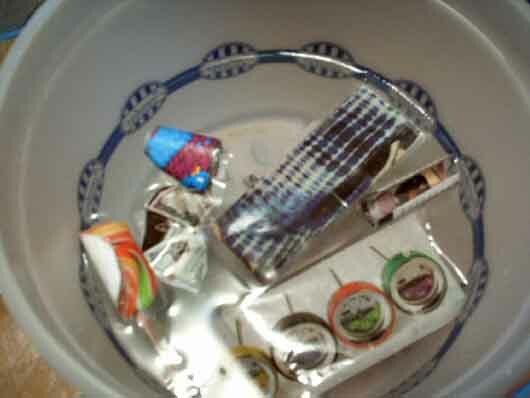 Reminds me of the terrible photos my family always made on their Brownie cameras agains vintage is too close to my age! Thanks so much for the lesson! I've also used caulking (like you buy in a hardware store and have to use one of those guns with the tube) to do transfers with toner copies and they turned out wonderful! About the blogger thing... you have to click on and higlight the photo (it will turn translucent blue), then look for your size and placement options. They will appear in a line somewhere on your screen... mine is usually at the very top. Then you click on what size youw want your photo to be (original size, small, medium, large or extra large) and the justification (right, center, left). Sometimes it is difficult to find. Hope this hleps! I kept my flaps to the inside so when it folded down it flattened out rather than doubled up (less bulky and looked better I thought). Also I didn't think the degree/angle of the fold made much difference to how perpendicular the pop-up was so stuck with 90 degrees. Oh and I only had 2 of the Big Ben pictures and one was on a scrappage so I have to prise it off and patch up the page as I tore the paper in the process. I'm another one who had done transfers with packing tape with some success. I tried a blender pen some time ago with less than stellar results. I'm going to give your gel medium transfer directions a try. I don't have a blender pen, but I will definitely be trying the tape and gel transfers. I just know I have some of that contact paper somewhere, two. Thank you for another very intensive tutorial! This is a wonderful tutorial! 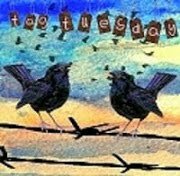 And, I think we've probably all had blogger issues--my issues is, they won't let me upload pictures anymore unless I reduce them way down in size, because they now want me to purchase space on picassa web. 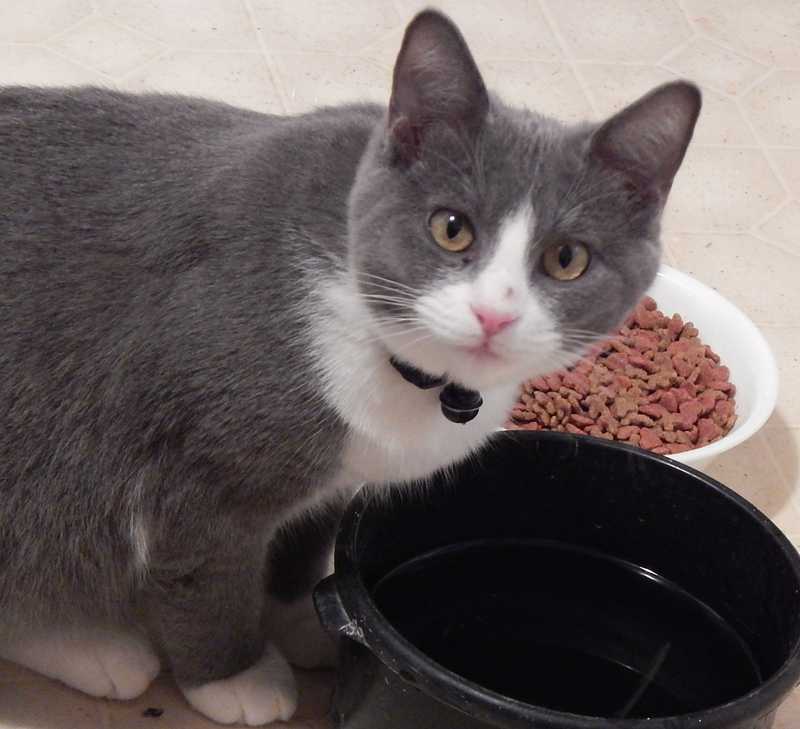 Simply reducing the photos is fine, and works, except on my actual blog layout. It will not let me upload anymore pictures in the layout no matter what--so I'm stuck, and I'm not an IT guy, so I don't really know what I'm doing exactly! 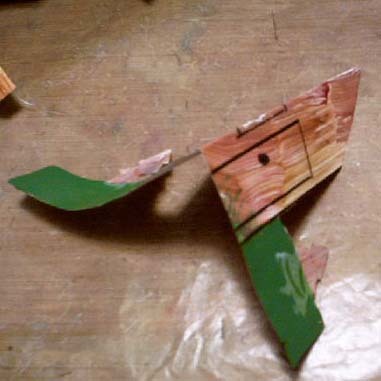 Truly frustrating--but now, I do think I could manage doing a simple pop up card. Thanks Elizabeth! So much eye candy here! I love the look of transfers but for some reason rarely do them. Not today. I am going to play around with a transfer tonight! Thanks for the inspiration! 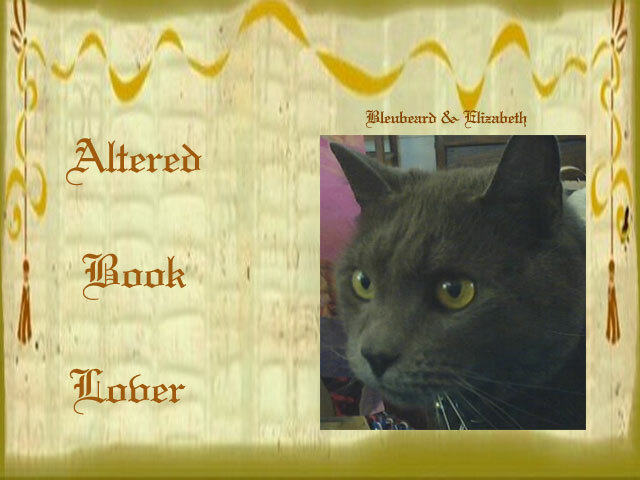 Hi Elizabeth, thanks for your nice comments on my Nessie page! Oh my book is most definitely sewn and I am glad that I listened to you and did not pass on this important "rule". Sure, you are welcome to use any of my homework pages that you want. Hello Elisabeth, this is a top tutorial. Everything is so interesting. Writing and working mostly in Germany I can't ofcourse get the transfer pen - never mind. I tried the sticky transfer and it works wonderfully. I am very thankful for this new technique. I am readig every lesson and enjoying them. I wanted to tell you this once. Oh YES Elizabeth, fireworks are a BIG thing here on 5th November as we commemerate the failure of Guy Fawkes and the Gunpowder Plot to blow up the Houses of Parliament. 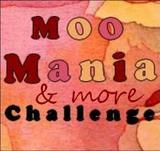 My fabric page is up on Mr Linky. Another huge lesson to work through, thanks Elizabeth. Very busy with a few other projects at the moment but trying to keep up. Have to get a blender pen for sure to try this method. Hi Elizabeth, how are you and Bleubeard?? 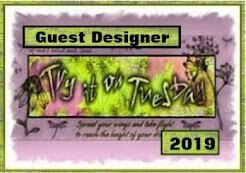 Wow another fab lesson my lovely, thank-you so so much, I have been wanting to try image transfers for ages and now have a jolly good reason to make the time for it. I hope to find the time to have a go at a pop-up too, here's hoping. Tee hee, can I ditto BJ above too, could I please possibly have your address?? 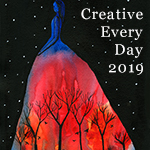 I have linked my fabric pages now, had soooooo much fun, thank-you for the inspiration. Love the lesson. 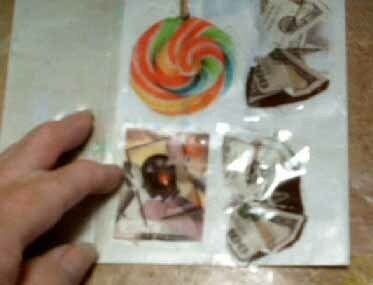 I've posted my pop-up and I will probably use the transfers in my still to make zipper lesson. Thank you for pointing me in this direction to answer the sticky paper transfer product question E! You really outdid yourself on this post. Transfers are a favorite thing of mine. With so many choices and ways to go it can easily seem overwhelming to pick just one.